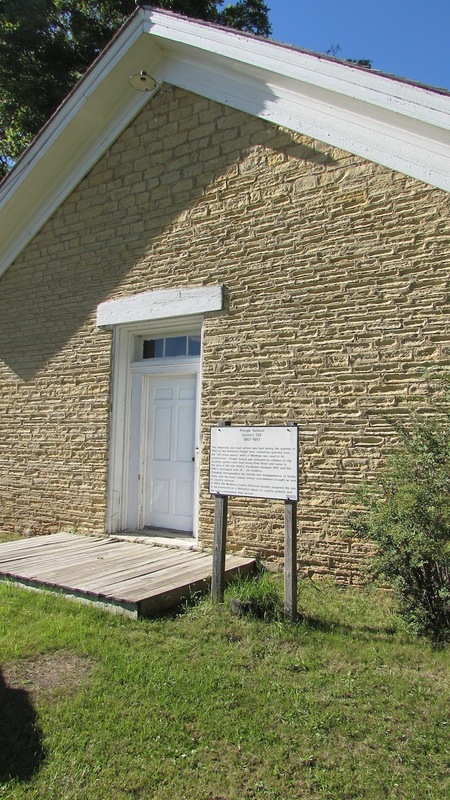 The Pringle School was built in 1867 of limestone quarried at Garden Prairie and transported by wagon to the site. The land was donated by the Patterson Pringles, and is located at 21596 River Road in Marengo IL. Much of the early history of Pringle School comes from a handwritten account by an anonymous writer, who was born in 1867 and was a student in Pringle School. The account describes the interior of the building as being a very spare environment. Long benches having varying heights to accommodate different sizes were ranged across the room. There were no backs on the benches which encouraged good posture and straight, strong spines. The highest bench for older children was at the back of the room – a boon for them as they could lean against the wall. There was no provision for writing surface, no paper to be used, until much later when brown wrapping paper served a second purpose, after being smoothed and cut for the children to use. Enrollment in the years from 1870 – 1940s fluctuated from 10 – 25 students. Books were scarce, even dictionaries were not always available. In the early history of the schools there was a fall and winter session attended by boys after harvest and before spring planting season. A summer session was held which was mostly attended by girls. The students carried on attendance well into their teens as there were no high schools. Many of Marengo’s early community leaders were products of this educational system, passing from the local district, directly to higher education. The 1870’s' account tells her teacher was Mary Wilson. This is the first in long line of Wilson females to serve as teachers in this school. Mary was the daughter of John and Margaret (Pringle) Wilson. Others of the Wilson family to serve as teachers were Edith, Marjorie, Margaret, Ruth, Jean and Kathryn. They derived from two generations of Wilson’s. It is not surprising that the Wilson name became added to the school’s name. One room schools were administered by the county superintendent. Teachers were required to fill out a detailed annual report, which contained attendance records, a detailed class schedule, student achievement levels, and explanation for retentions. The teacher also maintained an accounting for petty cash in amounts under $10. for such purchases as bats and balls. The county superintendent reviewed the reports, visited the schools, evaluated both the physical conditions of the building and grounds and also the teacher’s performance. The schools held fund raisers for such things as rhythm band instruments, a radio, and other classroom aids. One of the most popular methods of raising money was basket socials. Ladies young and old put together sumptuous meals in attractive baskets which were auctioned off to the highest bidder, sometimes eliciting escalating prices between rivals for the basket of the most attractive maiden in the district. Students sold seeds to raise money. Another unusual fundraiser was one carried out in Pringle School by Kathryn Wilson, who taught over 25 years in this school. The students were grouped into team of four students each and gathered walnuts in the autumn. They worked after school hours gathering, cleaning, and packing the walnuts in pecks and sold them in time for the Christmas baking season. Consolidation of one-room schools began in the 1920s in this county, but many remained in operation until 1947, including Pringle School. It became part of the Hawthorn School District 17 on Carmack Road. The building was purchased by Melba Brewington, a Chicago connoisseur of antiques, art, and glassware. She used the building as a residence until her death in 1967, when it was purchased by the DiBona family of Marengo. The historical society has owned Pringle School since 2002 and volunteers have undertaken its restoration and interpretation since then. Reading through the record books which were collected by the county superintendent one can learn much about the world outside the four walls of the school, and how the outside events affected the school. For instance, in the year 1919, the school closed for five weeks in October and November due to the Spanish influenza epidemic. School was suspended for half-days during the ’40s so that rationing books could be issued to community members. Some of the earlier teachers were men, some of them teaching the fall and winter sessions and switching to their own farm work in the spring and summer. Women teachers filled the position during the summer sessions. Later the profession was filled most often by unmarried women. If they married they were no longer eligible to accept employment. The last teacher in this school was in the late 40’s and she was a married woman, Mrs. Roy Stockwell.